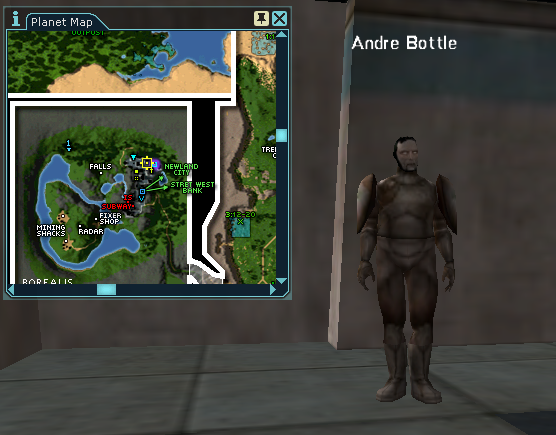 Andre Bottle is a special vendor. He's located in Borealis, between grid and Jobe whompa, and he only sells one type of items. Namely basic upgrades for The -000 weapons. While he's chatty, his stock has a thing or two to be desired. First of all, he got exclusive rights to sell them. And as such, he's free too wind up the price (guess this is new moneysink). Secondly, his stock only goes up to ql 150, which isn't high enough for ql 200 weapons (you'll need ql 180 for that). And lastly, he doesn't sell any advanced upgrades, required to equip weapons with special attacks. So if you're on tight budget or want to build higher ql of weapons or wish to add specials, you'll still have to trek to Bronto Burger in Holes in the Wall and chat (as well as perform some tasks for) Engineer Heath Bridges.